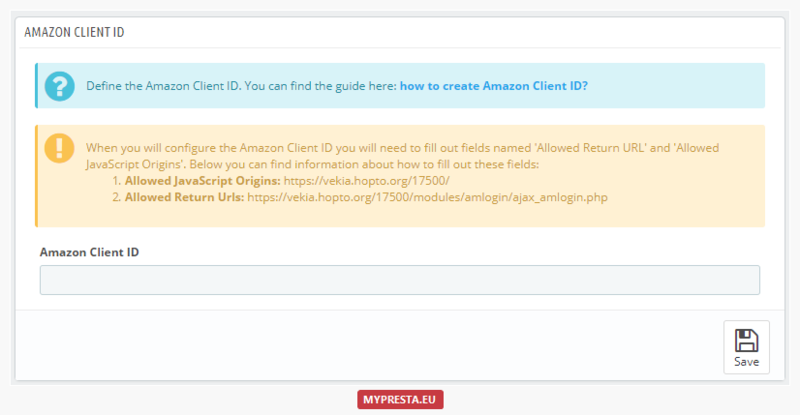 In this guide Ie will show you how to create Amazon Client ID for "Login with Amazon" module dedicated for PrestaShop. After completing this guide you should have a working Login with Amazon button on your website to allow users to log in with their Amazon credentials. First, you will need to register your website as an application on the App Console . In the App Console register a new application by clicking the Register new Application button. The Register Your Application form will appear. In the application details page, add basic details about your product. These details will be used on your website and mobile apps (if applicable). This is the name displayed on the consent screen when the users agree to share the information with your application. This name applies to Android, iOS, and website versions of your application. The description helps you differentiate each of your Login with Amazon applications and is not displayed to users. From the Application screen, click Web Settings . You will automatically be assigned values for Client ID and Client Secret. The client ID identifies your website, and the client secret is used in some circumstances to verify your website is authentic. The client secret, like a password, is confidential. In context of amazon login module the only one important credential is Client ID . So, you already have an Amazon Application. Now it is time to configure the the module. Copy Client ID generated by Amazon for your app. Then open 'amazon login' configuration page, there is a section to configure Amazon Client ID. Just paste there your Client ID and save changes. That's all - your Amazon Login module is ready to support Amazon Api!.